A must read and an all around shocking novel. Four kids, one mission to save the world. But maybe, just maybe, the "good guys" aren't who they think they are. This action-packed, science-infused adventure from the critically acclaimed author of The Countdown Conspiracy follows a group of seven kids racing to save the world from a deadly supervolcano. Perfect for fans of Chris Grabenstein and Peter Lerangis. Brianna Dobson has been chosen to work with world-renowned geologist Dr. Grier in Yellowstone National Park for the summer, and she couldn’t be more excited! But then Dr. Grier tells her and the other kids on the project the real reason she’s invited them to Yellowstone: A massive supervolcano in the park is about to erupt—and if they can’t stop it, Earth will be plunged into an endless winter, and civilization will be destroyed. Bri and her new friends are ready and willing to help stop the eruption, but unexpected dangers threaten to foil their efforts. 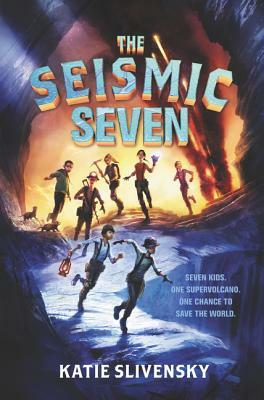 Will the Seismic Seven be able to defy nature and save the world? Katie Slivensky has worked and volunteered at zoos and museums since age eleven. She grew up in Michigan and currently lives just outside of Boston. She is the author of The Seismic Seven and The Countdown Conspiracy. Find her online at www.katieslivensky.com.